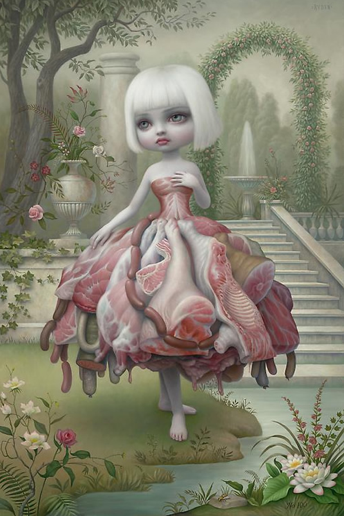 ever since art history 101 i've been inadvertently drawn to artists who's work has a facade of "nice" juxtaposed by a serious "creepiness" factor. the best non art example i can give of this is lily allen's deer dress. the first artist i came across with work like this was remedios varos, a mexican surrealist who paints beautiful silent women standing in canoes over lakes of lava, or sewing the earth's mantle from a tower high above the world. i'm also fascinated by the work of shary boyle, who creates simultaneously beautiful and grotesque porcelain figurines. similar to the ones your grandmother keeps on the mantle and yet...entirely not the same! finally - the exhibition i came across featuring helen eady. essentially they are a pastel selection of cute little animals - in flagrante delicto. 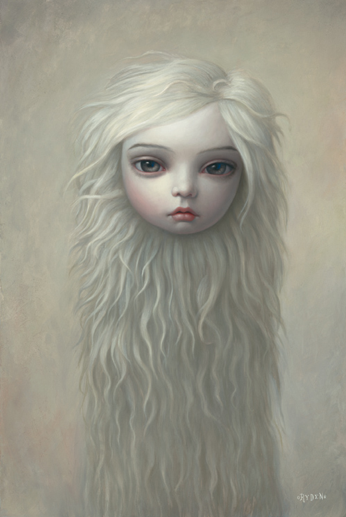 these works by mark ryden are equally as fascinating! but let me tell you this - i have chosen the four paintings below simply because i liked the colour story - they are however the least "offensive" of his entire online ouevre. *what do you think of the artwork i've mentioned today? disgusting, or diamond in the rough? whimsical, or wack? I like them! 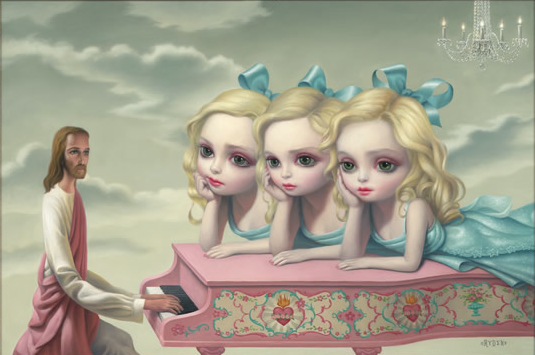 I wouldn't necessarily hang this sort of art on my wall, but I love looking at in and thinking about what it's saying! very insightful dad - and i think you might be right about the lady gaga dress! but who really copied who? these are weird but i am fascinated. thanks for stopping by - your comments are so genuine, i love it! i'm so very happy that i switched from history to art history half through my first year of university. i've never regretted it because art is so gosh darned inspiring! i love these! they kind of remind me of those garbage-pail kids cards from when i was little but way more sophisticated and interesting.